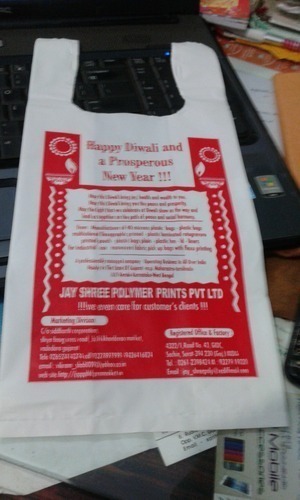 We “Jay Shree Polymer Prints Private Limited” incepted in the year 2003 are a well known and leading manufacturer and supplier of comprehensive range of Multiple Bags, LD Milky Printed Bag, Plastic D Cut Bag, HM Loop Handle Bag and Polythene Bag. Bags provided by us are used in shopping malls, supermarkets, retailer shops, sweet shops, restaurants and many more places for packaging purposes. These bags are designed under the direction of our experienced team members from the finest quality basic material and the latest technology. Offered bags are highly applauded by our customers owing to their features such as fine finish, excellent strength, tear resistance properties, moisture resistance, easy printability and durability. In tune with clients’ different choices, we provide these bags in variety of designs, sizes, shapes and colors. Besides, our clients can avail these bags from us in large quantity within promised time frame and at most nominal rates. we have been supplying plastic bags -in the state of Kerala-Andhra Pradesh -Tamilnadu-Maharastra-Gujarat etc.